Get a Bucket & Drip! When you get your fish from the local store, you should acclimate them OUT OF THE BAG no matter what the store told you! A bag can be depleted of oxygen in an amazingly short period of time. 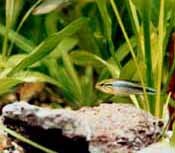 Though water parameters are not generally all that different, your fish still should be acclimated properly. I suggest getting a small plastic container of some sort, of about a gallon or two gallon size. Take a piece of airline tubing, cut it in half and reconnect the two halves with a plastic air valve in the middle. Start a siphon by sucking through the airline (now a drip-line) from your tank, into the "bucket" you will be placing the fish into. Cut the bag the fish came in and pour both the water from the bag and the fish into the bucket. Now, using the valve, adjust the drip to a very SLOW, but steady "trickle" of water from the tank into the bucket. Sometimes I will put an airstone in with a VERY LIGHT stream of bubbles to keep the water "oxed up." Now is the hardest part ... to wait patiently, taking an hour or two, slowly getting the fish acclimated to your tank&apos;s water. Most fish will come home in a quart of water or so. So, when you've doubled the water volume (which should take at least an hour), the water is now 50% store water and 50% your water. If you haven't noticed by now, your tank is undergoing a slight water change in the amount of water it will lose during this process ... so, be sure to have some new water ready to replace it with. When you've quadrupled the original amount of water, it&apos;s 75% your water now. After some time past this point it will be OK to put the fish in your tank. NEVER put any store water in your tank! Net or hand hold (if you're good with handling fish) the fish and introduce it gently to your tank. If it is an established setup, where several fish have territories, it is best to do it in the dark, after "lights-out." Also, moving a piece or two of coral or live rock will cause a rearrangement of territories, eliminating much of the beating newly introduced fish often take. Of course, it is always preferable to use a quarantine tank at first to eliminate the chances of introducing diseases into your established system. But, remember when you buy a coral or piece of live rock, there is a chance of "ick" or something else being carried into the tank on it. 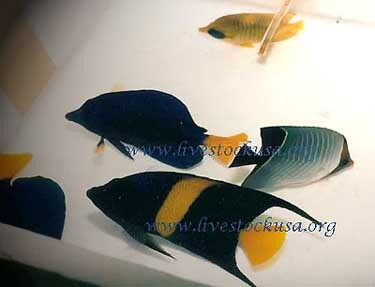 If you have no quarantine tank, it might be a good idea to give the fish a medicated bath before you put it in the tank. There are several good dips available for this purpose, as well as old-fashioned, but tried-and-true methods like a quick freshwater bath (watch for distress), or a formaldehyde bath before putting a fish into your system. 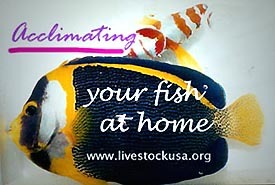 The main thing is to GO SLOWLY when acclimating, and dip the fish to sanitize it before you put it in your system if you are not using the quarantine tank method. 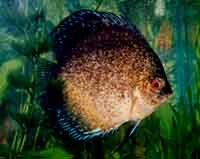 When I move a freshwater fish from one tank to another, I acclimate it with a bucket and drip line. 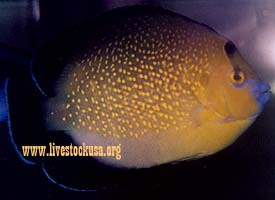 It is essential equipment if you intend on building a live fish collection!